At the Baikonur Cosmodrome in Kazakhstan, Expedition 53-54 Flight Engineers Mark Vande Hei and Joe Acaba of NASA and Alexander Misurkin of Roscosmos are preparing for their launch to the International Space Station aboard the Soyuz MS-06. Their journey to the station will begin with a lift off at 5:17 p.m. EDT Tuesday, Sept. 12 (3:17 a.m. Baikonur time on Sept. 13). Live launch coverage will begin at 4:15 p.m. EDT on NASA Television and the agency’s website. 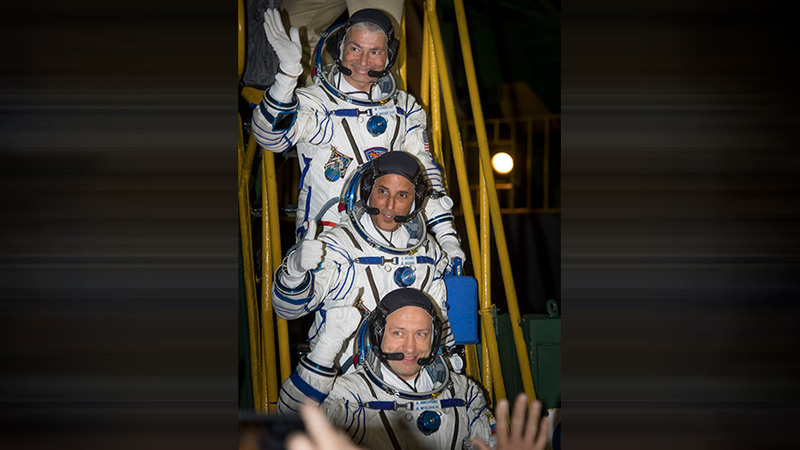 The three will join Expedition 53 Commander Randy Bresnik of NASA and Flight Engineers Sergey Ryazanskiy of Roscosmos and Paolo Nespoli of the ESA (European Space Agency). The Expedition 53 crew members will contribute to more than 250 experiments in fields such as biology, Earth science, human research, physical sciences and technology development. It’s is great to be alive at this time, when Space Exploration is at its infancy. Hard to believe that in a few years -not to mention eons- these procedures will be part of the past and people off all stripes and types will be living in Space. Wow, what a great adventure this will be for one and all. God speed.